Nigeria international goalkeeper Vincent Enyeama has joined French champions Lille. The Super Eagle signed a three-year deal for an undisclosed fee from Israel's Hapoel Tel Aviv. And the 28-year-old says he is excited with the opportunity of playing in the French league with the club. 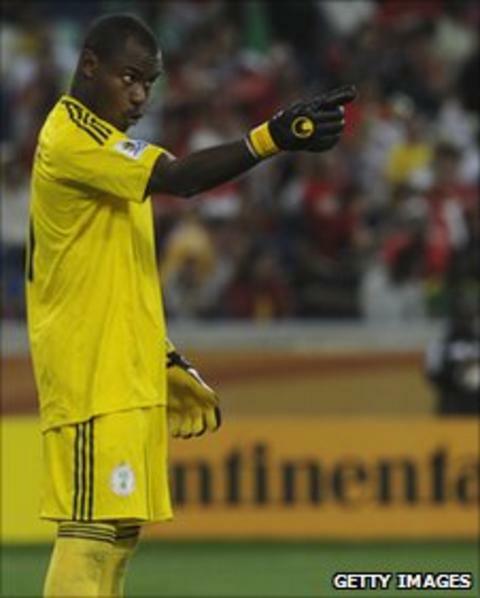 "It feels good to be here and the chance to play in a competitive league makes it very exciting for me," Enyeama told BBC Sport. "The club is magnificent. I feel welcomed and accepted - even before the medical - and that is a positive sign. "Interestingly, it is a club brimming with so much talent and I hope to bring the best of my ability to ensure a progressive step for the team. "The fact that they won the league-and-cup double shows how much progress they have made, but I am extremely proud to be around winners and win trophies here as well." Enyeama will have the chance to compete in the Uefa Champions League given Lille's first title in a half-century. After rejecting offers in England, Spain and Portugal, the Nigerian is confident he has made the right choice in Lille. "I considered a lot of things before coming here," he explained. "I also spoke to Osaze (Odemwingie) and he told me many positive things about the club. "The choice and decision was easy - this is a club with so many promises and I feel honoured to be here. "The opportunity of playing in the Uefa Champions League is also appealing I must confess." Enyeama has been the Super Eagles' first-choice goalkeeper since 2002 and experienced six years in the Israeli league, where he first tasted European club football. He won the Israeli league in 2010 and enjoyed back-to-back Israeli cup success both last year and this. "It is a big challenge for me but I'm confident - a different league but I'm prepared for the challenges ahead. "I'll miss my friends in Israel and my family also have friends there but in football change is constant. Enyeama burst into international light in the colours of Nigerian side Enyimba after winning back-to-back African Champions League titles in 2003 and 2004. He spent a season at rivals Heartland before joining Israel's Bnei Yehuda in 2005, where his performances attracted Hapoel Tel Aviv and the country's powerhouse snapped him up in 2007. As well as preventing goals Enyeama has managed to score 23 times for the Israeli giants in his time with them, mainly from penalties and free-kicks. His feats with Hapoel ultimately attracted interest from clubs in England, Russia, Turkey, Spain and Ukraine.